Now, don’t get me wrong. These are actually pretty good graphics for a Spectrum. They’re mostly monochrome, as was usual on that machine, due to its infamous color clash (basically, it could only have 2 different colors for each 8×8 square of pixels), but they’re well-drawn and detailed, and you can identify most of the other cars easily. The graphics are not the problem here. Neither is the sound, which you’ll be able to hear in the video coming next, sporting faithful renditions of two of the three classic Out Run songs, “Magical Sound Shower” and “Splash Wave”. Unlike most versions of the game (including the arcade itself), you don’t pick one song at the beginning and stay with it for the entire game; here, instead, it alternates between the two songs every time you go to the next stage. If you ask me, this way it actually works better, since you don’t listen to the same song over and over. 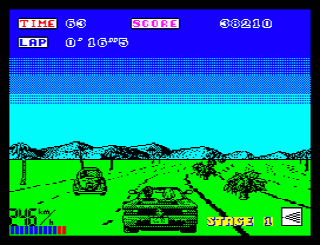 It also includes all the levels of the original arcade version, including the split paths, a feature left out of the Commodore 64 version, for instance. Yes, it’s a multi-load, which on tape could be pretty annoying (though at least in the 128K version it could keep several levels in memory, so, if on your second time around you chose the same stages, it wouldn’t have to load them again), but, again, it’s pretty understandable, considering the hardware and the size of the game. Noticed the problem? No, it’s not the annoying “skid” sound (which, incidentally, was even worse in most of the other ports, including the Amiga one). It’s the speed, or, more precisely, the frame rate. Not only does it kill any possible sensation of speed, but it actually makes the game much harder to control, since, with a frame rate of 2-3 fps, it’s quite possible that you have pressed a key and the screen hasn’t updated yet — noticeably. And the speed you saw here is on a mostly empty level; the one with the rock structures, I’m sure, goes below one frame per second… and, no, I’m not exaggerating. Now, yes, the Spectrum had its limitations, but, come on. I’d think it obvious that a game that played like this wasn’t ready for release. Couldn’t they lower the graphics detail? Optimize some routines? A racing game needs speed, needs a decent frame rate; if you’re not getting it yet, you don’t release. Just for fun: get a ZX Spectrum emulator and Out Run for it, load up the game, and change emulation speed to 200%. 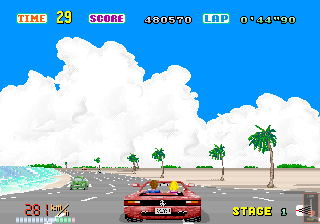 Surprise: the Out Run port actually becomes a smooth, very playable game. In other words: the code US Gold released would require a hypothetical twice-as-powerful Spectrum, running at 7 Mhz instead of 3.5, to be a decent, enjoyable game. This should tell you something.